What was the motivation to paint a mural, Andrew? Creating artwork with meaning has been my goal as a creative. I desire to connect with people other than myself on issues who rarely get the attention. I have discovered, in my years of creating and showing work, that I am only reaching a small audience. More recently Sarah and I have been creating work alongside each other via our own modes of expression (painting/storytelling). The weight of the work we're coming up with has only fueled the desire to appeal to more than the small gallery-goer/art magazine-flipping population of this world. In the way that we combine painting with storytelling to allow inclusion with our work, we also are driven to make that work accessible to the masses. Public art was never on my radar until I was struck with these feelings. Displaying in galleries seems to always be the pinnacle of success for visual artists. I’m not poo-pooing on serious spaces with room for reflection and vocabularious conversations, I’m just saying, I know a lot of people who don’t go to galleries. And I think the more I create alongside Sarah, the more I’m realizing our work is meant for a wide impact. Not a bubble. Because we're sure as hell not making art to be notable/wealthy(by society’s definition)/famous/selfish. I came across some artists who opened my eyes a little to what a mural could be. It showed me that a mural could be approached from the fine art perspective. As opposed to (mostly what I had been exposed to) the graffiti approach (also not poo-pooing on that). So then I asked myself, “Can’t I just paint fine art on buildings instead of canvas?” So, this past March, Sarah and I set out to do just that. We found one of our favorite interior walls in town owned by our friend Stephen. He gave us nothing but accommodations, opportunity, and trust in what we set out to do. A blessing for sure! This wall is the 40 x 11 foot wall that spans the length of The Hyppo Cafe in St. Augustine, FL. Being the production home of every pop in the Hyppo brand and the hottest lunch spot in town, it was also the only location in the Hyppo family that wasn’t adorned with an interior mural. When The Hyppo Cafe opened, I was given the opportunity to show my work on its walls. So, in terms of being part of the community through my art, I already had a very personal connection to this space. This wall quickly became the right fit for our biggest painting to date. Because this was an interior mural, we appealed to the subject matter of the space... Fresh, Fruit, Pops, Color, Energy. To showcase a bit more of the ingredients for the iconic pop, instead of the pop itself, I sourced photographs of the unique fruits and veggies alongside head pop maker, Kyle, at the market. I took at least 4 photos of each fruit with different light direction to lend itself to the concept of a swirling effect that aligned with the natural light source from the front windows in The Hyppo Cafe. This would allow me to build the radial composition one form at a time. It would also allow me to paint on the wall directly from photographs in later stages. Once the prep was done, we bought pure red, yellow, blue, black, white, and magenta interior latex wall paint. Acquiring pure colors would allow me to mix on site without getting the muddiness that swatch mixes could have caused. A couple four-inch rollers, pole extensions, paint trays, cheap rags, a borrowed ladder and we were set. I was initially attracted to the roller (rectangular) application of paint as it shared the same blocky effects I’m drawn to with square brushes when I work on canvas. We know we won’t be painting just fruit and veggies in the projects ahead, but this process proved and disproved a lot of speculations we had about the execution of such a gigantic undertaking. The greatest reward from the process was seeing that a mural can indeed be painted with the layers and loose style I'm most comfortable with on canvas. It’s not as daunting now as we plan for bigger walls. This experience embarks on a new goal for myself and Sarah. We did this together. And it wouldn't be what it is if it weren't for the collaboration. This was Sarah's first time taking charge of her painting skills, but we can already tell this is going to be a strong team moving forward! The message is one that is simple. It just needed to be proclaimed in a huge way. The Hyppo has such a respect for the pieces that make up the whole of their product. Ingredients are selected and cared for with prestige, and the process of doing so is energetic. It is fun. It is human. And, in a way that mirrors The Hyppo's respect, Sarah and myself rely solely on fruits and veggies to survive. With both of us being vegan for several years, we have a personal connection to the health aspects of everything we painted onto the wall. The recognizable forms of fruit and veggies are not readily visible at the cafe, so we wanted to promote the real, nutritious, and life-changing plant-based ingredients that make up the power of a Hyppo pop and decadent food of the cafe. So, we are one week away from the pop-up art show displaying both new and older works that need to be shared. It showcases about 10 large paintings on canvas and paper, and a number of small studies, all accompanied by words written by Sarah, my wife. I wanted to just sit down and reflect on the momentum and meaning of this show for me and Sarah. I reflect best when I ask myself questions. After 5 years of teaching middle school art I have made the switch to being a full-time artist. To fully immerse oneself into the the world of making art for a living, one must have a goal to work toward. A deadline. So we made one. With every deadline comes self-assessment. An assessment of “why I want to make art.” And my answer directly influenced what this show would be: I want to use my talents, preferences, experiences, approach, and passion to affect another individual in the way they see this world. Maybe what I do will initiate a conversation personally or socially. And maybe, that individual might be a little better off in how they go on. That is my goal. I attribute the last 6 years to giving me the inspiration for this show. I’ve had shows and created work within these years, but this show will reflect on the overarching themes spanning from a time of being almost homeless, alone, and looking for a job to the present, coming off a teaching job of 5 years and being newly married. A spectrum of hurdles. I remember my days in college when I searched high and low for messages I could apply to my painting. Now, after refinement, I have content to communicate. My process has flip-flopped and that’s okay with me. It’s natural this way. Themes have surfaced over the years and I am nothing but thankful for the growth within myself to recognize them. Certain experiences and emotions have become worthy. And nothing keeps me from alluding to them in the studio. What inspired this show/these themes? I am very much a human first and an artist second. And that’s an order refined since college. I love what the artistic process does for me and my spirit, but ultimately, the ideas in which I use my art to express have taken priority over just the application of paint. Finishing out my latter twenties in St. Augustine supplied the themes for this particular show: deprivation, choices, vulnerability, God, opportunity, self-reflection, creation, resistance, and prayer. And mirroring and confirming these issues with my wife Sarah has only exploded the impact they’ve had on me/us. Why these themes? I want to speak to very applicable matters. I’d like to think that we can speak to some root issues. Issues of the imperfect human being in this present day. Or any day, for that matter. Really, the themes are timeless. But they are personal, and oftentimes root issues to the bigger more often-heard humane mishaps in the world. Sarah and I have experienced many of these issues both before and during our marriage. We find them worthy. Worthy of praise, or simply noting. Because we don’t think we’re the only ones facing these pressures and realizations in this world/St. Augustine. And so, the one truest thing we hope to put on the wall is honesty. Communicated through our own respective expressions. A dialogue of sorts. What will make this show a success? Ultimately, I would love for it to be a time of reflection within the viewer. And I hope that Sarah and I are singing notes that resonate with the individuals who see our work. Combining my paintings with her words is a new thing for us. I love the way I ruminate and talk about a work of art. But I also know that the way I look at art doesn’t accurately reflect how all people look at art. And that’s where I’m excited about the inclusion of these words. Not everyone is reached the same way. Maybe it’s one or the other, or the marriage of the two. I don’t ever want my art to be intimidating, and having another route of understanding can only pull the viewer in closer. Also, I like it when people want a meaningful work of art in their home space. They want it as a reminder. Or a conversation starter. And, because my own minimal budget doesn’t allow me to buy much these days, I understand the limits of acquiring art. At this show, we are presenting works at varying costs, so if a piece strikes someone, they might have the opportunity to make it their own in a way not always offered at art exhibits. This show embodies all that we are working toward as creative individuals. It is what we believe we were meant to do right now, and it is something that is made for all to see. If you're in or near St. Augustine, we hope you'll join us Friday, September 30th. Due to a new open/free schedule to create, I have set out with the intention of starting again. And by that, I mean, brushing up on rudimentary skills. Literally. Stepping back. Simplifying. 1. Identify, mix, and apply value where appropriate. 2. Focus on mark. What can be done with one large brush? 3. No throwaways.... make it work! These sketches each had their struggles, and I think it's the evidence of the struggle that interests me most. Each mark is the representation of a small decision. And when I see each final sketch, I see it as a recording of impulses, thoughts, attentions, and actions. I would think to myself... "How am I going to show likeness when I have a one-inch brush?" But, somehow, the composition of all marks brought them together successfully. I was chasing the illusion of light hitting a form and the accuracy of likeness. And each of these, at least once, got to a "this is trash!" moment, but through patience (walking away and looking at something else for minute) and rule no. 3, they all worked out to my satisfaction. Pretty cool! Aside from the skills I wanted to reinforce within myself, there is also meaning. The meaning exists in the process. The duration. Whether it be an acquaintance, a best friend's child, a good friend, or a wife... the meaning, for me, is the time they were on my mind while painting them. And these, I was happy to spend some time with. It's always wonderful when a small idea turns into an attention-sucking, labor-intensive, and detail-oriented work of art. I was approached recently by our local magazine, St. Augustine Social, to create map imagery for the city's upcoming 450th Birthday Celebration. I jumped on the opportunity, mostly because I had never done such a thing. Needing inspiration, Google happened. I was greatly inspired by the cartoony, flat, Adobe Illustrator-made map style that's popular (which to me is very reminiscent of Grandma Moses). I borrowed this light-hearted approach, but searched for a way to make my own. In addition to not having a skill set with most things Adobe, I foresaw something with layers and hints of depth and shadows. And well, something a little more me. Tangible. Thus, began my Sharpie, Scissor, cut-out, taping, painting extravaganza of the tiny city I live in. I've realized that the journey of a painting is important and every bit meaningful for the solution. Over the past two days, I've labored over this self-portrait (which actually was layered on top of last week's painting.) It is a paper with a lot of history.. And, what I love, is that every mark, every cover up, every misstep had to happen in order to create this final product. Layers and various viscosities of paint continually praise or disregard the work underneath. I have never painted without struggle. This painting was no exception. And within the struggle, uncertainty thrives. What I'm most proud of with this painting, is that I have found a maturity in my stopping point. Not an end with absolute realism, but an end with absolute meaning to me. This work reached a pinnacle of energy with me and great change happened quickly. It "blew up" visually and symbolically. The background seeped into the subject and the eyes were removed. In the moment these changes were design choices, but they establish a lasting meaning. A meaning arrived upon organically. The visualization of "uncertainty." An idea mirrored in the process itself. As you'll see, this painting has been through many stare-downs and adjustments. I typically take a snapshot in the studio, walk away, view it small on my phone, make a mental to-do list, and then revisit the studio. Looking with fresh eyes is a sweet sweet thing. I've started a rebellion of sorts. A rebellion against my own formula. These pieces of work are different for me. They expand on the paper paintings I've been doing lately, but they take things in an unexpected direction. A direction based in text. When you find yourself on the floor with a nub of charcoal and thirty scribed pieces of paper, you realize, there's been resistance within you. Obviously, things needed to be said. Recently, these things poured out of me on what started as a moody day, but turned out to be a day I would gladly return to now. A day of clarity. A day of closeness to God. There was a fluidity that I can only assume was created by coffee, prayer, dirty hands, loud music, and charcoal. I was in the "zone." Whatever the recipe, prayer is the ingredient to which I give most credit. What came out was a reflection on me and my time, readings, relationships, God, life, and death. You know, the deep stuff. It was writing without purpose or intent. It was without filter. The ripped-from-the-roll paper gave me randomly sized, oblong pieces of paper. So, the paper size and the charcoal bits were my only limitations of what could be written. Some words were deleted, some added back in, some glued into sentences, and others left appropriately cryptic. I was left with a stack of really great takeaways. It felt like evidence of a grand moment that had then passed. Days later, in my own aggravation with painting, I stumbled across the stack of papers again, and realized, at that moment, the writings surpassed the power of what I was trying to create visually. They were more direct. Still open to interpretation of the viewer. But just so honest. Written with the same haste as initially written, I picked up a brush and dark mix and the words went over top of failing paintings, with much error and everyday handwriting. A modest delivery of my very human messages. As I said, this work is different for me. I have many reservations and struggles with my painting. The struggle always deals with the validity and cohesion of the body of work of which I am making. It is the most profound memory I have from a college professor, the best advice I can give to others, and yet the piece of artmaking I always stress over. Making cohesive work. Conforming work to fit in a series. Yet, I can still hear the words out of my professor's mouth, "Your work will be cohesive, because it is all coming from the same mind." This is all true. However, I like series. I like package deals. I like to feel as though some works are brothers and sisters to other paintings with similar color schemes and subject matter. I give myself limitations. Literally, a frame of mind. I see the dangers in thinking this way, though. And, it is precisely this way of thinking that landed me in the position to not love what I was painting. It makes me happy to share these with you, and at the same time, know that there may or may not be more just like it. There is great freedom in that. This is a work conceived from the two contrasting mindsets of my life. 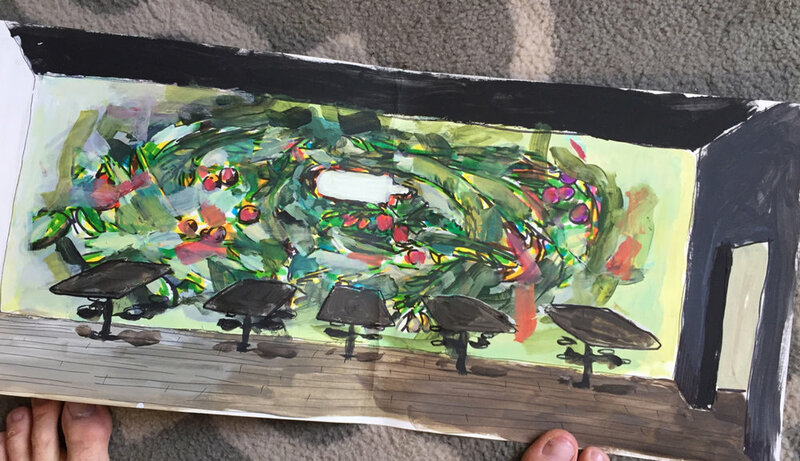 A split mind birthed from a split schedule: artist, and middle school art teacher. On one day, I explore the nooks and crannies of the inspirational, emotional, and energetic work of my own. Work that is a constant struggle and joy. And usually happens alone in my studio (shed) under the soothing shade and ecosystem of the multi-lot spanning tree in my backyard. And, another day, I explore the realm of 13-year-olds in order to find the creative solutions that give momentum to their creative journey in life. Within the walls of a cold, germ-infested, fluorescent light buzzing facility, my students think "life stops" and "strenuous demands begin." But, I've enjoyed, throughout the years of teaching, practicing the basics, that are the foundation of all creative work. As they are contrasting worlds, they do feed off one another. It is a joy to share my work with my students, because they've only yet known artwork to be pretty, and created by that "starry night guy." And, it is a comfort to wear myself out on the mindless exercises of contour drawing, demonstrating linear perspective, squeezing critique responses out of children, and problem-solving the "oops" moments in a process. I feel these things can be elementary at times, but I've noticed how they have strengthened my core of art making. A couple of weeks ago, we delved into the process of printmaking. And with the limits of the cost of blocks, I assigned my students a brainstorming mission for a theme that spoke from their heart. "An image that only you can make, given your background, experiences, and preferences. What is something you would hang on your wall?" The outcome: mostly sports, dance, clothing apparel. But also, themes, of loneliness, death, friendship, futures, and God. My job finds its happy moments when I get to witness the unfiltered creativity of 13-year-olds in this way. In preparation for teaching this unit, I tested out my own block and fell in love with the process for the first time since college. The contrast between quick, gestural decisions in my painting process and the organization of precise gouging designs is vast and refreshing. As I searched for direction within my own work, I decided upon this study of hands to use for my first print. I can't get away from the physicality of hands. They can express so much. And, this image in particular has a sensitivity that I just love. I like having the option to go a little further with my work and be able to not explain, but deepen the meaning of the visual with a haiku. This is something I suggested for my students as well. The haiku offers them words to direct, but also limits them by syllables. This was a challenge for most. I am pleased to present this as my "gateway print." I've caught the bug and I am eager to create more. I printed a limited edition of Hands no. 3 to be sold individually in the effort to fund the next print. You can find them in the shop. I have always found that small, observational practices have strengthened my ways of seeing. Lately, among some bigger projects, I've rediscovered my joy of small, quick studies by reusing photographs, as well as taking new ones. Each of these studies is founded to create a more confident hand and eye, but I've quickly realized that my mood, energy, daily happenings, relationships, word, and prayer have taken part in the experience of creating. And through this, they become more than exercises of the hand and eye, and more of a daily reflection. This has motivated my choice of subject matter, as well as the process. It has been an absolute pleasure to see the "stepping stones" of my makings to come. These pieces, like some of my others, are not conditioned for a physical life that will withstand the elements for the next century or two. They are ephemeral. They will evolve. They will disintegrate. Just as I do. And that, I appreciate. If you are interested in having your own one-of-a-kind stepping stone, please visit the shop. With flesh being my focus, I find it necessary to show the layers. To let the complexion be not just one color choice, but dozens instead. Veins, muscles, fats, tans, and freckles cause subtle hue and value changes all over the body. It's never always "flesh tint" from the tube. As I may exaggerate these subtleties, my process starts with vibrancy. As my paint thins with the layers, it allows an often glow to shine through. Which, to me is a lovely resolution. However, as one that prefers privacy in the studio, I find it hard when these unfinished pieces are seen without their epidermis complete. But for this instance, I think it's okay for you to see. Many of my pieces go through this transformation. When I view artwork, I'm either 10 feet or 2 inches away. It's my favorite way to see art. I find myself doing a lot of walking in the studio. This is a detail of a 5 foot painting with a theme of autumn. I love that a close up of these colors and strokes non-objectively hint at the theme.